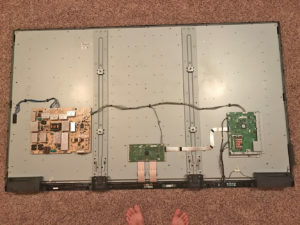 This is my first go at TV repair but I have a situation where this large TV belonged to a client and something happened where the digital inputs (4 HDMI ports) quit working. The analog (VGA and Y Pb Pr) inputs did work. The client used this tv for the board room and now most things connect via HDMI as well as their A/V Receiver sent everything from the STB and Apple TV and HDMI wall plate to the TV over HDMI. So not having those ports operational makes it basically useless. Sharp has sold its TV business off to a Chinese manufacturer (Hisense) a few years ago so there are no more new parts for TVs like this. ShopJimmy and ElectroParts have none. 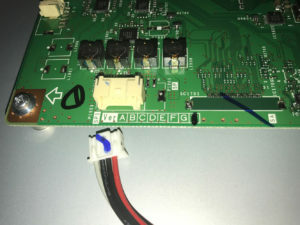 I told the client that the only way to fix it was to take it apart find out the board model/partnumber then go online, hope we can find a second hand board that works properly and order it and pay me my hourly rate for all this. They decided to just order a new Samsung 75″ 4k HDR model that was under $2k from Amazon. Not too shabby. They wanted to know what to do with it and I told them I would take it off their hands and recycle it and they agreed that would be the best path forward. I am now the proud owner of an 80″ Sharp LC-80LE642U TV and I’m not a TV person but I do love classic movies. I set up this TV and my Sony A/V Receiver and Sony BluRay player (via Y Pb Pr) and let me tell you. The sound I have setup is amazing and this large picture really makes it worth sitting down to watch. Now that I have exhausted all the BluRays I have I’m ready to get to my Apple TV to stream thousands more movies I have on my computer than just what I have on discs from 2010-ish. I took the TV down, laid flat on the carpet. Removed all the screws (there are a lot and the ones along the bottom are different from the rest. I would keep those separate if I were you. Remove the back plastic cover (USE THE SERVICE MANUAL) you have to pull and push in certain directions to get it to release properly. 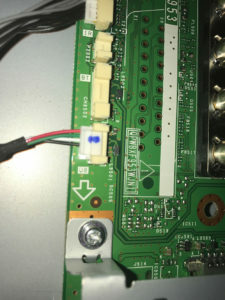 Once open the Main Board is on the right. That is the board that is responsible for this kind of problem. Yeah so that didn’t work. Ive got another board on the way from a different seller, the seller of the bad board of course hasn’t responded to my messages yet but it is a long weekend so I will give him until Tuesday before opening a case. The board was a Ver A not a Ver H like I needed. The picture in his listing showed H but he was using a stock photo. Waiting for the next one to arrive. 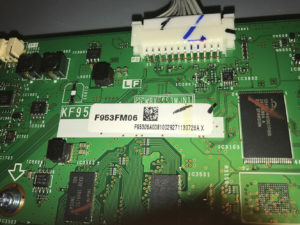 New board comes in and I learn that the command is Input and Volume Down to force the tv to start, but it doesn’t matter because that was the wrong version board anyway. Then Channel down and Volume down to enter the service menu. I put the new Version H board in damn it I got same result. I don’t know why or what could possibly be going on.